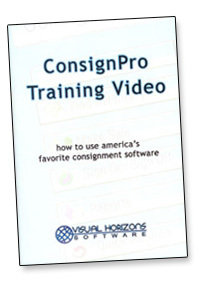 This newly released, 3-DVD, 7-hour training video walks you thru every aspect of the ConsignPro software system from the very basic to the more advanced. Taught by the creator of ConsignPro, Mr. Brian Wilson, you will learn the ins and outs of ConsignPro at your own pace. This training session, originally held in Miami Beach, now can be shown in your living room on your DVD player! The video is accompanied by a 50 page handout, also used in the class, that follows the video presentation. Due to the nature of video products and duplication, this is a final purchase item. To order the ConsignPro Training Video simply call us toll-free at (888) 721.9767 or order online on our secure order web page.